This video was recently posted on Daily Kos and I thought it would be interesting for our readers to see it for themselves here! The State writer Brad Warthen wrote this. Harvard’s Institute of Politics recently reported that when it comes to the ever-chased “youth vote,” Sen. Barack Obama leads the field of Democrats along with Republican Presidential nominee Rudy Giuliani. As I read, and then re-read the report, I was struck with a strange sensation of fear and utter concern. The juxtaposition of these two candidates with particular regard to the youth vote may as well be compared to the juxtaposition of peanut butter and Italian salad dressing. Before you balk at my statement, hear me out. Hungry for change and direct involvement with the hijacked political process, youth have begun to turn out to the polls more than ever in the last few years. Stats show that the 52% of 18-29 year olds that showed up to vote in 1992 is well within reach this election season. Not only is that number well within reach, the results of the 2006 midterm elections prove that youth are unsettled and untrusting of a war-hungry Republican administration. In nearly every crucial run-off, the pro-war Republicans lost their seats as the voices of the people rang loud and clear. Do you think there is a correlation between the youth vote and the ’06 results? This brings me back to Obama and Giuliani. Sure—I recognize that term youth has no underlying connection to progressivism or the Democratic Party for that matter, but doesn’t it seem odd that Giuliani, who so fervently sides with the Bush administration on Iraq war policy, is leading among youth? If people are tired of the Bush administration’s failed policies, why support a protégé of the President. Perhaps it’s time to point out the major difference in the two—that which I just mentioned: the war. “The worst thing to do is show them weakness,” “I’m afraid that Democrats haven’t learned that,” Giuliani said. In my mind, weakness is not admitting your faults, and continuing down the same path, getting the same results without fail. If it looks like a duck, walks like a duck, and quacks like a duck –why in the world should we call it a chicken? 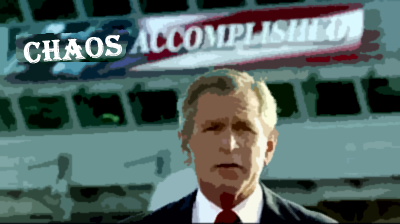 We have accomplished nothing in Iraq. The war was what the Democrats won 2006 on and it will still be fresh on their minds in 2008. I hope the youth today realize that Barack Obama—though a fledgling politician at the time, had more foresight than any other candidate on the platform today. It’s as if he looked into the future, saw the mess we are in today, and said no—absolutely not. If there is one good thing about Giuliani having the backing of Republican youth, it’s an indicator that the vote will be more “left” in 2008. I simply hope that youth recognize the failed policy of our current Presidential administration and heed that notion when they cast their vote. I also invite those undecided voters to consider the following statement: “ We must understand that the might of our military must be matched by the strength of our diplomacy.” –Barack Obama. We have it on very good authority (George W. himself) that, in this post-9/11 world, it is imperative to strike the first blow when we have the slightest notion someone–anyone–out there means to hurt us. Hit first and hit hard. Any perceived enemy is fair game. No hard evidence of imminent danger necessary. His job, he declares, is to protect us fom harm. What a fair and sensitive guy he is. Or not. Insiders say he has a petty mean streak a mile wide. And he smirks when he punches below the belt. The sitting president plays host, every election cycle, to newly elected legislators. Everyone’s invited to the White House to meet and greet the Commander Guy. They all make nice–even though they’ve said some pretty awful things about each other during campaign season. The 2006 shindig was a doozey. Senator-elect Jim Webb (D-VA) was there. He’s the ex-marine who beat Bush buddy/wannabe George “Macaca” Allen in a tight race. Senator Webb was no supporter of Dubyah’s Iraq War and, unlike the Prez, Webb actually had a son serving his country in Iraq. He chose to avoid Bush during the White House reception. Not a bad idea when you’re no fan. It beats hissing at him. War Games. That’s what it’s all about. It’s just fine to play the War Game when the “pieces”–the toy soldiers–belong to somebody else. When the same group of military families bears all the burden of The Game while the rest of America shops and complains about the cost of a gallon of gasoline. There’s an answer for that. Look to games to define the rules of fair play for games. We need a draft again. Not the old one. Nothing like it. The old Selective Service was just that: selective. There were easy deferments for those who could afford to stay in college. Lots of Vietnam era privileged guys got a sudden yen for graduate degrees. And you could avoid the draft altogether–like Dubyah, like Dan Quayle–if your daddy had money, power, influence. He just saw to it you got bumped ahead of every other guy on the National Guard waiting list or got you into graduate school, even when your academic record put you mighty low on the list of applicants. Nope. Can’t have that again. We’re going to play fair this time, no matter whose keester winds up in the sling. First round: The kids, nieces, nephews and grandchildren of every member of the Executive Branch of government. The president and vice-president are the first to see their families’ kids off to war. Second round? Kids from Legislative Branch families. Third? Department of Defense and war-mongering think tank policy makers’ kids. Fourth? Hit up big business. Defense contractors, oil company execs…take your pick. If you love the notion of a war, if you stand to make a profit from it, your kids are gone. It’ll work. I’m sure of it. There won’t be another Vietnam or Iraq in our future–not with the sons and daughters of the powerful at risk first. You can bet we’ll see some serious talking going on; a veritable renaissance of diplomacy and intelligent, compassionate discourse in solving problems worldwide. No more dishonest, for-profit, pre-emptive rush-to-war. Ever again. The cost of such a war, our leaders will tell us then, is just too high. Rock with Barack refines its message! As I began my usual morning activities of surfing the Obama website, watching the YouTube videos of speeches and promos for hours on end, losing track of time after having read blogs and new articles related to the Senator, and missed my afternoon classes as a result, a certain image kept coming back to my mind. It was of Barack Obama, standing in the middle of a crowded café, sleeves rolled up, collar loosened, and a bit of sweat on his brow. The people in the café are silently watching, gazing with an awe-struck look of inspiration, listening to every word as if it tasted like a sweet desert that they hated to come to the end of. The image was a still shot of a video where Barack is explaining his background, and at this moment, when the flash went off, Obama is telling the crowd about his efforts as a community organizer and a grassroots activist. Barack Obama led efforts to register over 150,000 new voters in Chicago. I was already inspired by the man, but at after working with the board of directors for Rock with Barack in an attempt to refine our message and goal, it became clear that we should model our efforts at the grassroots level after those of the man we so fervently support. I want to tell you about an upcoming project that Rock with Barack is leading. We have decided to focus our volunteer efforts on voter registration in the state of South Carolina. By December 30 2007, we want to register 10,000 new primary voters in the state. Certainly it’s an ambitious goal, but we have a certain audacity of hope that leads us to believe that we can accomplish this. South Carolina is so important to the primary elections. The voter registration procedures are more difficult than most states, meaning that the number of people registering themselves may be lower than in other areas. We can help them, and I hope you will join our efforts. Right now, under the direction of Obama for America staff members and the South Carolina Election Commission, we are assembling what we call an “army of volunteers.” The idea is to get as many people on board, interested in helping in the Fall, signed up to sit at tables, go door-to-door, and whatever else we need to do to get this done. We want to work with surrounding states too, hoping to combine resources of other grassroots groups to create something substantial in the Fall. Once our “army” is in place and we are certain we have made a good deal of contacts that want to go out into the communities, things will begin to start. For now, we are recruiting, and like Uncle Sam, we want YOU. I know we have the ability to do extraordinary things.